Roman Halter was born in 1927 in Chodecz, a small village in northern Poland, the seventh and youngest child of a traditional Jewish family. At the outbreak of war, in 1939, at the age of 12, he was deported with his family to the Lodz Ghetto, where, his grandfather made him promise to tell the story of the Holocaust. From Lodz he was sent to Auschwitz, Stutthof and Dresden; then to a children's home in Theresienstadt, until, the only member of his family to survive, he was finally brought to London in 1945 by the Central British Fund. He went on to study architecture, establishing successful practices in London and Cambridge. In 1973 he settled in Israel. Harnessing his architectural skills within a design context, he was commissioned in the same year to design and construct the main gate to Yad Vashem, established in 1953 in Jerusalem as the world center for documentation, research, education and commemoration of the Holocaust. On returning to London in 1976, Halter became a full-time artist; he died in London in 2012. Roman Halter's work has been exhibited in the UK by The Imperial War, Museum, London, Tate Britain, the Redfern Gallery, the London Jewish Cultural Centre and Ben Uri Gallery in 1976, 1979 and most recently, 2014, in an exhibition dedicated to his stained glass practice. 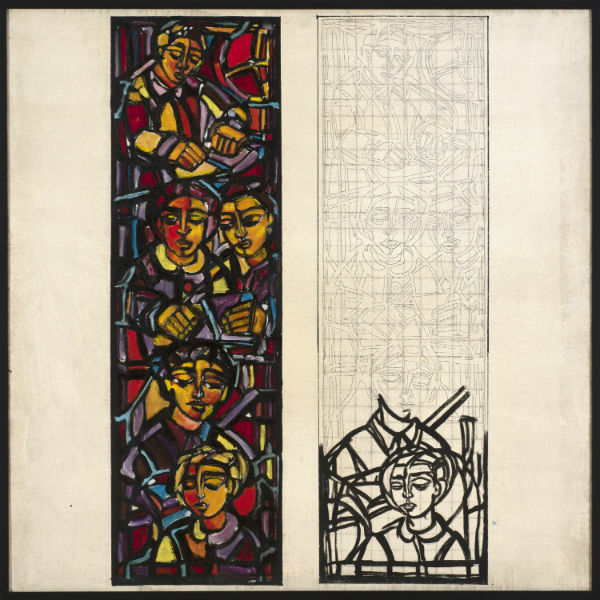 His work is in a number of public collections in both the UK and abroad including Beit Shalom, The National Holocaust Centre and Museum, Nottingham; Central Synagogue, London; The Imperial War Museum, London; Lady Sarah Cohen House, Friern Barnet, London; Leo Baeck College, The Sternberg Centre for Judaism, London; The Liberal Synagogue, Elstree; the Ghetto Fighters' Museum, Israel; and Yad Vashem in Jerusalem.